Kristin Callahan was born on April 20, 1981 in North Reading, MA. She was a good student, a wonderful sister and daughter, and a recently converted vegetarian. She dreamed of attending college to become a nutritionist, and teaching others about living a healthy lifestyle. 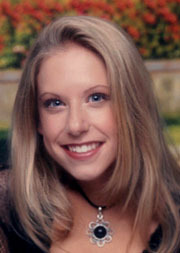 On June 25, 1999 Kristin went for a run on what was to be the last day of her junior year of high school. While jogging in a park less than a mile from her house she was stricken by undiagnosed Hypertrophic Cardiomyopathy, and did not come home. Only after this did we come to realize how much of an impact this disease would have on our lives. It was determined that HCM had also claimed the life of Kristin’s father in 1982. Her brother was tested and was found to also have the disease, and immediately underwent surgery to implant an Automatic Implantable Cardioverter Defibrillator as a preventative measure. In less than a month, this heart condition that we had never heard of had completely turned our lives upside down. The Kristin M. Callahan Foundation was founded to work toward a day when other families might be spared these same hardships. Early detection and proper treatment are essential in preventing sudden cardiac death in young athletes. Our ultimate goal is the eradication of this condition, so that those who might have been afflicted are given opportunity to live life to its fullest, without the restrictions that come along with an HCM diagnosis. We hope that you will join us in this fight. Thank you for visiting us.